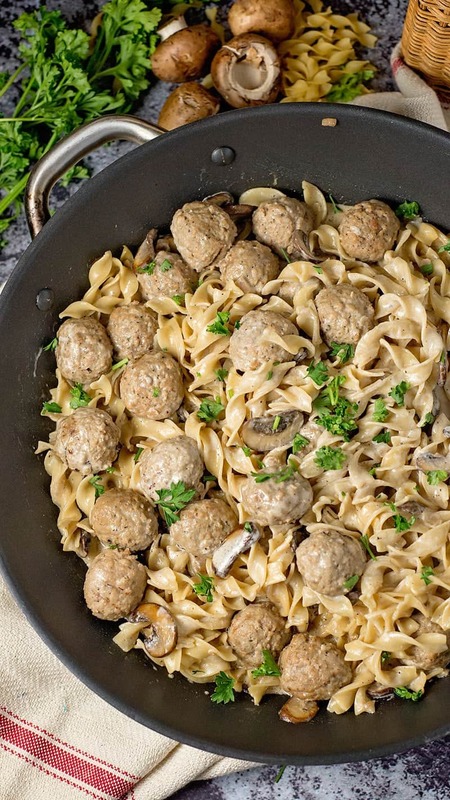 This Shortcut One Pot Meatball Stroganoff recipe is a creamy, delicious and comforting dish that the family will devour and will please even the pickiest of eaters! This post was sponsored by No Yolks as part of an Influencer Activation for Influence Central and all opinions expressed in my post are my own. 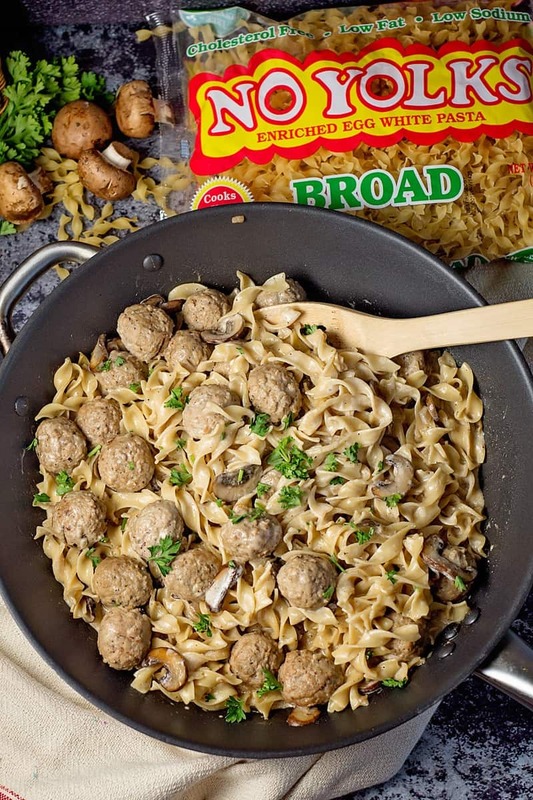 Noodles and meatballs (not necessarily together) are definitely staple dinner ingredients in our household. If I had a dollar for every time my kids have requested noodles for dinner… Well… I’d have a lot of dollars, lol! Most of the time, I’ll make noodles with butter and parmesan, but sometimes I get creative and add chicken, veggies or in today’s case, meatballs! 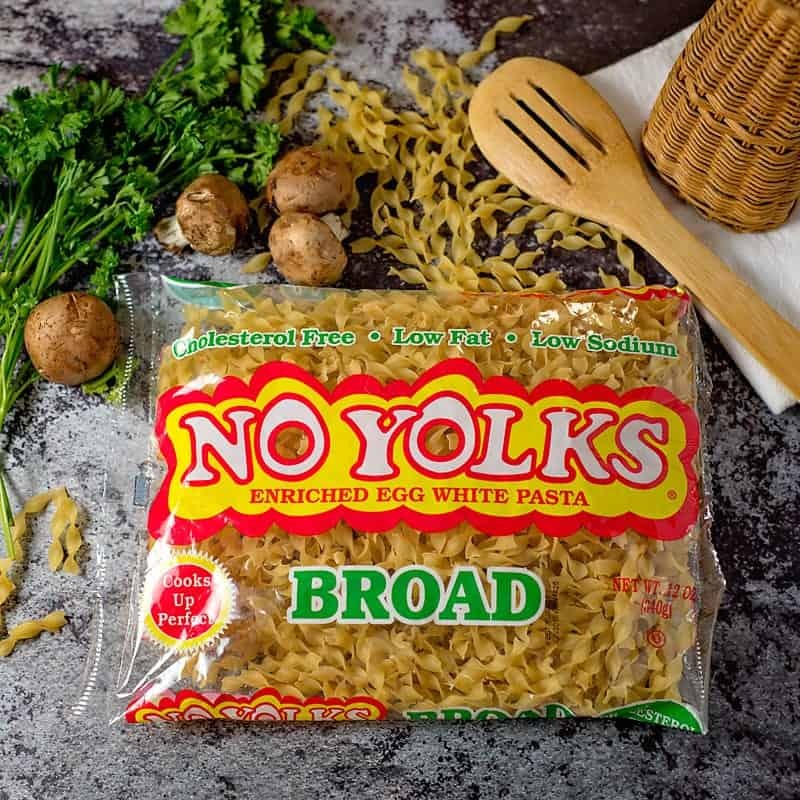 Our go-to brand for noodles is the No Yolks Broad Noodles. The No Yolks Noodles cook up in a flash and can be used in just about any type of recipe; they’re great in soups, casseroles, stroganoff and of course on their own with butter and parmesan. No Yolks come in different sizes so they’re great in almost any recipe. (Broad, Extra Broad, Fine, Kluski, Dumplings, and even Stir-Fry – which I can’t wait to try out). They’re made with egg whites which makes the noodles low in cholesterol, fat and sodium. Need a few recipe ideas for next week’s menu plan? You can find tons of recipes and videos, (like this Super Creamy Chicken Noodle Skillet) here on the No Yolks recipe page. 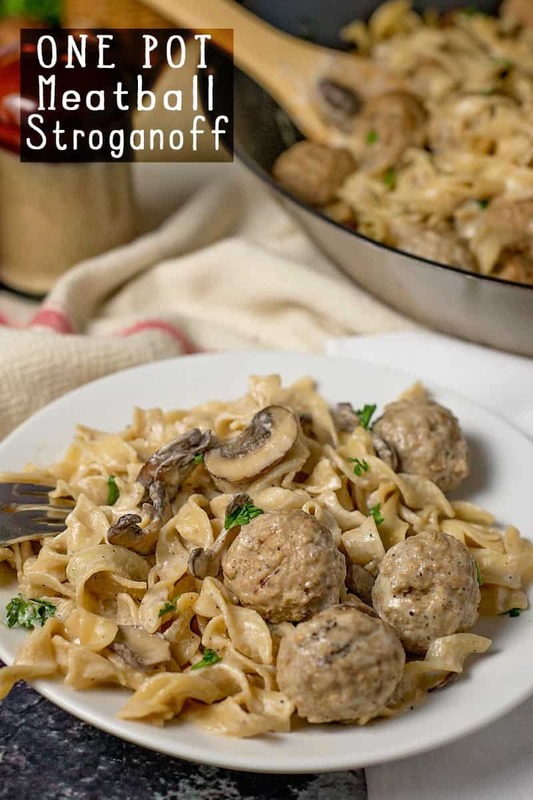 Stroganoff is one of those universal comfort dishes that almost everyone enjoys and you’ll love how easy this One Pot Meatball Stroganoff recipe is to make. You can have the meal on the table from start to finish in 20 minutes! 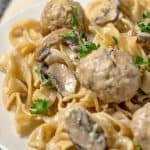 To speed up the preparation of this dish, the noodles are cooked in the beef broth, then heavy cream and sour cream are added along with the meatballs to make a deliciously creamy and comforting shortcut Meatball Stroganoff. If you’re a mushroom lover – definitely double the mushrooms. Sauce will thicken more as it cools. For more sauce, you can add more cream. Now it’s your turn! What’s your family’s go-to meal for busy nights, share in the comments below. 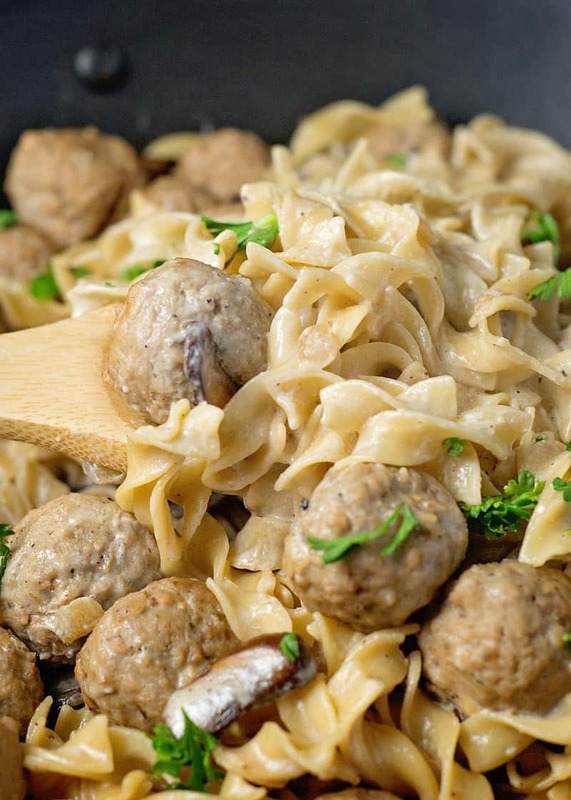 Meatballs, (the amount you desire – see tips above) defrosted and warmed up in the microwave. Add butter to a large skillet and heat skillet over med-high high heat. Add mushrooms and onions and cook ’til browned. Add beef broth, garlic, Italian spice blend, salt, pepper and noodles to skillet. Cover and cook for 6 minutes, stirring occasionally. 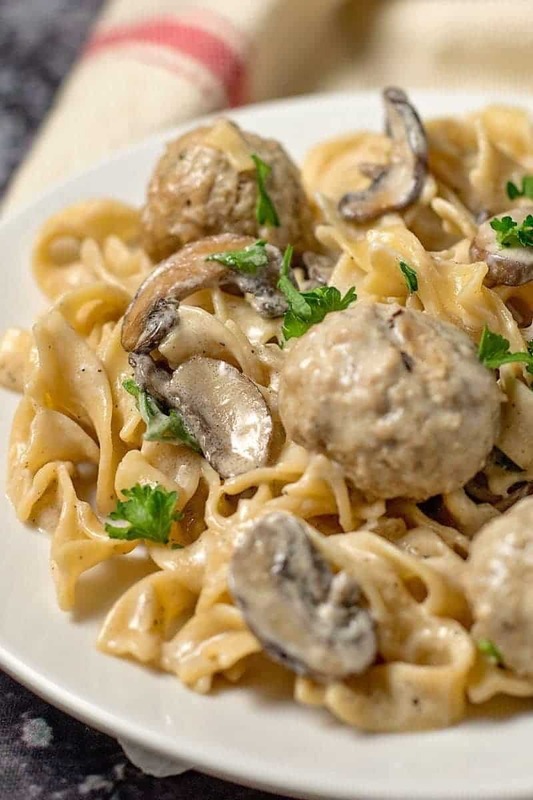 Stir cream into the skillet, add meatballs. Reduce heat to med-low. Cook an additional 3 to 4 minutes until liquid thickens a bit. Gently stir in sour cream and heat through. Could you make ahead and freeze everything except the noodles. I’m not sure that’s the best choice for this recipe. Do you add the egg noodles cooked or uncooked? I made this for dinner tonight; it was a HUGE hit and so easy to make. No leftovers! Everyone had seconds. Thank you!!! I made this meatball strangoff tonight and got rave reviews. It was quite easy and would do it again.